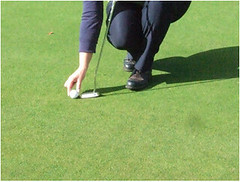 May a player use the toe of their putter to mark the position of their ball on the putting green? May a player use a loose impediment, such as a twig or a leaf that they found lying on the green, to mark the position of their ball on the putting green? 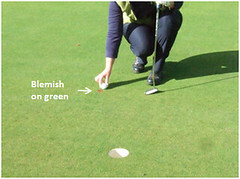 May a player use a blemish on the surface of the putting green to mark the position of their ball? No, a physical mark must be used. 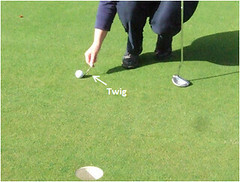 However, the word "should" indicates that this is a recommendation of best practice and a player is not penalised if they use an object that is not similar to a ball-marker or small coin to mark the position of their ball. Under Rule 20-1 it is necessary to physically mark the position of the ball, so reference to a blemish on the ground does not constitute marking the position of a ball.